Boy, they can dish it out but they sure can’t take it. But retard? Honestly? I guess it wasn’t enough fun to profit off of idiotic racist slurs so they decided to insult people with developmental disabilities, too. I would question their maturity, but I have too much respect for 5 year olds. But the school yard bully behavior of Baker Skateboards to one side, this t-shirt requires a response. It’s not just an example of profiteering off the misery of others, it’s irresponsible. Bullying is among the most frequently named problems facing Asian American students. And if you want details about what that looks like, roll over to this. And it doesn’t stop with kids, as evidenced by the case of 19 year old U.S. Army soldier Daniel Chen. Mr. Chen was subjected to weeks of racial harassment while in training, and then violent hazing once deployed to Afghanistan. Daniel Chen responded to the hazing and harassment by committing suicide. And, BTW, Asian Americans commit suicide more frequently than members of any other ethnic group in the U.S. excepting Native Americans. But I’m guessing the folks at Baker Skateboards are aware of the racism facing Asian Americans and simply don’t give a rip. 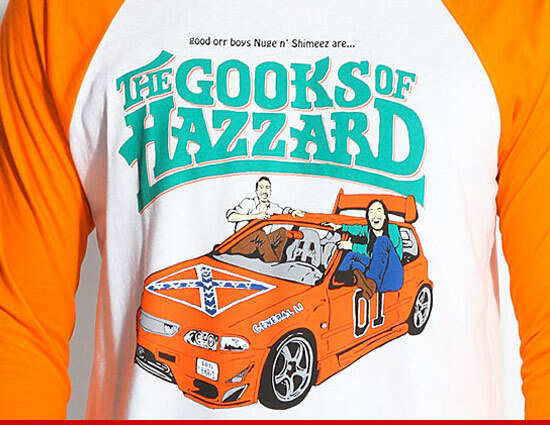 If they did, they might consider for a moment how the controversial t-shirt fits within a larger context of Asian American experiences with racist stereotyping, scapegoating, intimidation, and violence. Making jokes of the sort featured on their t-shirt trivializes this context. Worse, it makes racism of this sort cool in the skating subculture by giving it the endorsement of a popular retailer owned by a famous skater. When we trivialize racism by making jokes about it we contribute to a climate in which folks think racism isn’t such a big deal. And, you know, maybe it wouldn’t be if all racism amounted to was speech. But, of course, we know that racism isn’t just about what folks say. Racist words and images have the power they do because racism is also expressed in actions ranging from political persecution (as in the case of African Americans and the war on drugs) to employment discrimination and even to violence. When we make jokes like the one on the t-shirt, we are tacitly endorsing the whole range of ways in which racism is expressed in our culture, and that ain’t a thing to laugh about.